Disruption. It's a word that we hear a lot of these days, but how many companies can claim to be truly innovative in their industry? Essentially what we're investing in is structural growth, focussing on innovations that benefit consumers, whether it be through a new, more innovative product, or a great product at a materially reduced price. Here we focus on A2Milk, TPG and Xero, and how they are looking to turn their industries upside down. Milk from a typical herd of cows contains the proteins A2 and A1. The A2 milk company produces dairy products that are free of the A1 protein, and only contain the A2 protein. Why is that important? A building body of research has indicated that the presence of the A1 protein, once digested in our small intestine, releases a peptide called BCM7, which can result in symptoms that resemble those of lactose intolerance. To a consumer, what does this mean? A lot of consumers are either formally diagnosed or self-diagnosed as lactose intolerant. A2M has been able to deliver a product which is free of the A1 protein in dairy products. Consumers have been responding to the observation that while some may be lactose intolerant, others are actually only intolerant to the A1 protein. Essentially, it enables these people to return to consuming dairy products. That’s a disruptive innovation, and it’s what gives the A2 milk company an edge. The product has evolved significantly since fresh milk launched in 2007, as a joint venture with Freedom Foods that took 3 years to turn a profit. 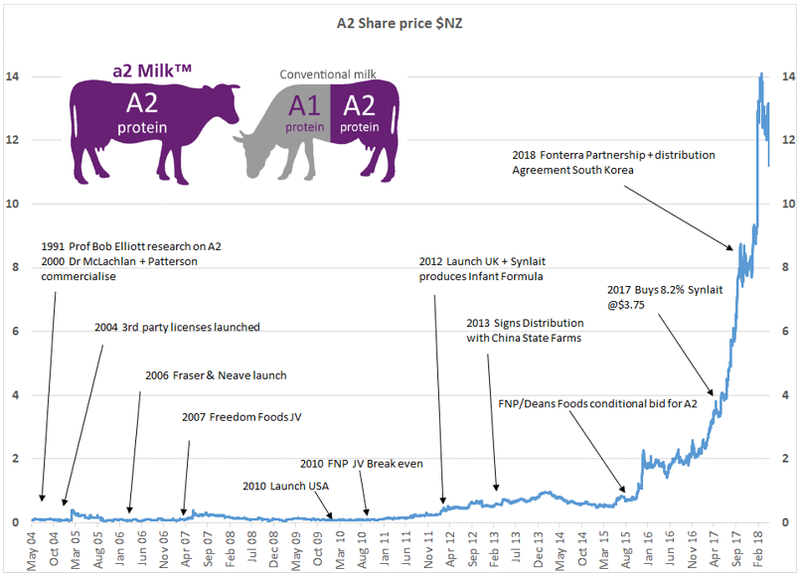 The key moment for this company was the development of an A2 only infant formula product with Synlait, a dairy producer in New Zealand. The A2 platinum tin you can see below is the new-look design, available in stores beginning June 2018. Infant formula has propelled A2M's profit growth, representing 80 percent of sales, the key innovation but by no means the only one. A2M has also launched a milk product in the U.S., as well as product extensions into pregnancy formula, stage 4 junior milk drinks and A2 blended with manuka honey is about to be released as well. Looking ahead, A2M will be launching new products targeting the adult nutrition market, akin to Sustagen but with an A1-free (A2-only) formulation, broadening its customer base from babies to the above 50 years of age cohort. The addressable markets A2M is targeting are very large. In Australia, the infant formula market is $800m, but that’s dwarfed by China, which is a $25 billion AUD market. It was only 2014 when this company had NZ$110m worth of sales. In a short 4 year period, A2M has gone from NZ$110m to over NZ$900m in FY18, and is aiming for 10% market share in China, which would generate sales approaching NZ$2b over the medium term. The distribution channel for A2 milk in terms of sales to China, goes by two pathways. The predominant channel is the Daigou channel, so Australian post into China post via personal shoppers. The other channel is through their direct to China sales. A2 Milk now has over 12% of its infant formula sales through this channel, shipping directly out of the plant in New Zealand into Chinese digital channels and 9,000 mother and baby stores across China out of an addressable store base of 20,000 stores. By no means is the A2 proposition only based on the science, the numbers are telling you something more than that. Consumers care about the provenance of food, all the way from point of production to consumption. Over and above the health benefit for an A1 protein intolerant consumer, the proposition that's resonating with consumers is the high quality of the product. With a management team that has executed its strategy with near flawless capabilty, needless to say, we see significant profit growth ahead for A2M and handsome valuation upside based on our discounted cash flow projections. The telco industry has been disrupted by the NBN, and it will be disrupted once again by the development of 5G networks. The combination of new 5G technology, spectrum (should TPG be successful at auction), together with its existing back haul assets will enable TPG Telecom to disrupt the incumbents in a major way by delivering a compelling product at a dramatically cheaper price. TPG's price per month for mobile subscribers to its 4G / 5G-ready network will be launched at $9.99 a month for data after a free trial period. Why is TPG able to do this? TPG runs it's own business in a nimble, low cost way and the incumbent has been profiteering. The industry went from a 4-player market to a 3-player market, when 3 Mobile and Vodafone merged, and Telstra, Optus and Vodafone just marched up the price of our mobile phone services, to the point where the margin Telstra was earning on its mobile business went from 25% to 35%. Together with high frequency waves and a collection of other technologies, the new innovations in 5G are small cell networks. These small plates can be put on much lighter infrastructure, like power poles, the corner of buildings and traffic lights where they can direct traffic to your handset, car or device. Speeds are 20 times faster than the modern 4G network, allowing the world of broadband and mobile merge. Currently TPG has no mobile business, but once it goes live with a mobile product it will be attacking large profit pools within Telstra, Optus and Vodafone whose businesses will be impacted by TPGs presence. When ISPs were forced to move to the NBN, and essentially Telstra's copper network was nationalised, network input costs rose from $25 to $50, a $25 per subscriber per month crunch to industry margins. What TPG is doing now is developing its own 4G / 5G-ready network and the marginal cost of that network for them is something like $10 per subscriber per month. TPG is aiming to recoup some of that lost EBITDA margin by virtue of the fact that in 5 years time, 5G will be ubiquitous and consumers will be indifferent whether it's their mobile contract or their broadband contract supplying data services. The modem in your home will actually be a 5G service for many people, thus TPG will be disintermediating the NBN itself by delivering services off its own network once again. That's the profit pool that we see TPG recouping in terms of their return on invested capital (ROIC). TPG's ROIC right now is falling as it is for the whole industry because they’ve been disintermediated by the nationalisation of the copper network by the NBN. But TPG's entry into the mobile business via their network build, together with its existing backhaul capacity will see a disruptive displacement of high NBN input costs, helping TPG's return on invested capital to double from 14% over the next 5-7 years. If you're a patient investor, this is a stock you might want to add to your portfolio. If you’re expecting a quick gain in the next 6 months, it's probably not for you. There's a common ledger, a single source of truth, one set of figures that are available to the SME and their accountant in real time, linked to bank feeds in a seamless way. On top of that, Xero is a bit of an iTunes store. There's an app ecosystem that sits around Xero and that adds utility and value to the customer. For example, one of these apps “unleashed” is an inventory management system, so you hook in your unleashed app together with Xero and essentially you have a mini ERP system for an SME. The product has evolved substantially over time. It used to target SMEs that had 1 to 10 employees, now they target SMEs that have 1 to 200 employees. And as you can see, it's really resonated with customers. It's the number 1 cloud accounting software system in Australia and New Zealand, well ahead of MYOB. In terms of new subscribers, Xero takes 60 percent of them on the cloud accounting system - this points to the dominance and the quality of the product. The marketing tagline is, 'Beautiful Software,' we've seen many demonstrations of the product ourselves, and we’ve interviewed scores of small businesses and accounting partners building our confidence in this product. They speak with passion about how this business has transformed their own business. Essentially what Xero software has done, is allowed the accounting partner to elevate themselves from someone who reconciles the books and does the tax returns quarterly, to someone who can advise the business, watch the cash flows of the business in near real time and add value. To the SME, the win is it's seamless. It's all on the cloud, the invoices shoot through to the single ledger, get reconciled once and their accountant can see it in near real time. What that does, is let them focus on their core business. Many have seen strong profit growth in their business because they're spending less time reconciling the books and more time selling their product and servicing their customers. So, that's the growth potential that sits in front of Xero and why we think the company has such strong growth ahead and compelling investment appeal. Dushko: What are the barriers to entry to this market? Do they have international patents and if so, when do they expire? And who are the major international competitors?